In my day, Georgia State University had an accomplished and dangerous basketball program. I used to go to games at the GSU Sports Arena in the evenings after class – your student ID got you in to all university athletic events for free – and watch the Panthers play – and beat – almost everyone I saw them up against. If it started getting late, I’d head on home and pick up the end of the game on WRAS 88.5 as I drove home down I-20 from the H.E. Holmes MARTA station. I loved watching those Panthers, led by Coach Lefty Driesell, play ball. It was like watching the Harlem Globetrotters take on the Washington Generals – it was exhibition play at best; pure theater. Georgia State began to build a reputation as having a lot to offer recruits, from a chance to play downtown on an urban campus to the leadership of a legendary coach like Driesell. From working, albeit briefly, in intercollegiate athletics at Georgia State, and from my work as an editor on the student newspaper for a few years, I saw first-hand how the team struggled to get fans to come to the games. There was always plenty of capacity when I went. The school was still largely a commuter campus; people parked, rode MARTA to the Georgia State station, attended class, and boarded the trains to go home. There wasn’t even any student housing within walking distance of the Sports Arena – you had to take MARTA or a Panther Express shuttle to the old Olympic Village (now occupied by Georgia Tech students and, I presume, still sinking). It was inconvenient to try to go to a game, especially to watch a team just trounce on Stetson or Mercer or Jacksonville. All good things come to an end. Driesell retired in the middle of his 41st season as a coach and his lieutenant took over – a man whose tenure was so memorable that I can’t seem to find a reference to him from any reliable online source. Georgia State slid into the murky mists of obscurity, and losing once more became routine. “He Who Shall Not Be Named” was fired, and former Ole Miss head coach Rod Barnes was hired, leading the Panthers to a stirring 44-79 record. But now, there’s something happening down near the corner of Courtland and Decatur streets. Georgia State – pegged in a conference coaches’ poll to finish second-to-last in the Colonial Athletic Conference – is presently tied for first. No small feat, given that the CAA has seen two of its teams wade into the Final Four in as many of the past two seasons. This is a small, but extremely competitive, little athletic conference. Last night, while my wife watched her “stories” on the good TV in the living, I slipped into the office and watched Georgia State play on my old 27-inch set. I sat in my old armchair, smoked a pipe, farted around on my laptop, and watched the Panthers inch ahead, fall back into a tie, slip back, tie again, and then – somehow, jump out to finish with a 14-point win over the University of North Carolina-Wilmington. I’ve never heard of UNCW, but then, not a lot of people have heard of Georgia State, either. 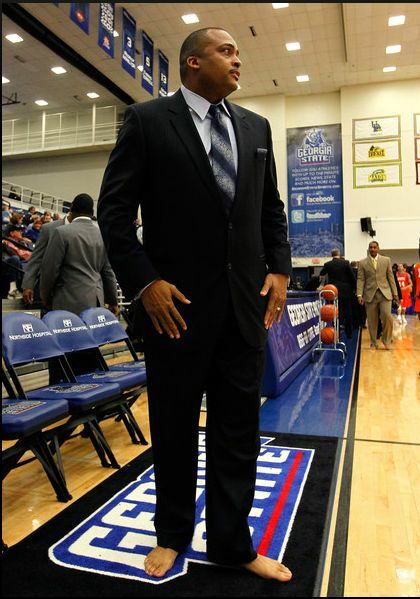 On the sidelines was Georgia State coach Ron Hunter, whose team has now won 12 of its past 13 games and scared the piss out of the formidable William and Mary – with whom GSU now shares the conference lead – on the road. Coach Hunter was barefoot. The Panthers put down their traditional blue home jerseys for an orange that wasn’t quite Tennessee orange but was still unsettling. The cause was Samaritan’s Feet, which donates shoes to people in parts of the world who have none. (I could get behind a cause like that – I hate going barefoot. Even just wearing socks isn’t great for me. I like my house shoes. And I loathe open-toed shoes, like flip-flops and sandals. Toes break too easy. Besides, I had holes worn in the bottoms of my shoes once in college and walked through a puddle of some weird substance that MARTA had used to spray down one of its stations and got chemical burns on the bottoms of my feet. Even in the developed world, don’t underestimate the value of a good pair of shoes.) Students turned out for the game en masse – the largest crowd the Sports Arena had seen since 2008, when most folks were really coming to see Florida State play. But the point is, people came. Not only that, but some sat outside on the sidewalk with tents and signs that said, “Hunterville.” On the news that night, there was a report about how Hunter was going to coach barefoot. Students got behind a cause. That doesn’t happen at Georgia State. It never did when I was there. The last time I saw or heard anything about the nearly 30,000-strong student body getting excited about anything was when we got a football team, and that was only for, like, one game. People were impassioned about the coach – so humble that he’d coach in bare feet to raise awareness for a cause a world away. People were impassioned to watch the Panthers – their Panthers – take on a rival. People came out, braving traffic and vagrants and a MARTA station that always smelled to me of urine to watch a basketball game about a block down from the state capitol. It was televised. They talked about it on the news and wrote about it in the Atlanta Journal-Constitution. Basketball in Georgia has long been about Georgia Tech, who plays in the ACC with programs like Duke and NC State, and to a slightly lesser extent (again, as far as basketball is concerned) about Georgia, because it’s Georgia and that’s what people talk about. Hell, even their gymnastic program is admired – and more than just for the outfits the ladies wear. Still, for this season – which is, perhaps, an aberration – folks are going to have to start talking about Georgia State (again). And, with Coach Hunter’s vision of where he wants the program to go and the breakneck speed with which he’s got it so far, Georgia State hoops is going to be about all anyone’s going to be talking about in Atlanta for a while to come. Hello Dear, are you truly visiting this site regularly, if so afterward you will definitely take nice experience.